I took Amtrak from Pasco to Portland where I hung out for 4 hours and then connected with my transfer to the Lincoln city. www.caravanairporttransportation.com I happened to find this transfer company that picked me up from the Amtrak station in Portland and dropped me off at D River Beach in the middle of Lincoln city. My next week was to be spent with Mac & Barb McDougal!! What an incredible couple!! Both Barb & Mac have a wealth of knowledge about the history and geography of the United States of America. My home for the week was at Lake House B&B on Devils Lake. www.lakehousebb.com Mac and Barb are a retired couple, and they love to travel. So, they have registered with an Inn Keepers Relief company. B&B owners will contact them to "babysit" thier guest house when they want a break, and Barb & Mac will come in and look after the place for a week or two!! Great way to see different places, and get paid for it and stay in great accommodation. Barb & Mac have been staying at this particular B&B for a number of years now, so they know the local area very well!! Little did I know that I was going to be on a whirlwind tour of the entire Oregon Coast, not just Lincoln City. So, the Pacific coast was not what I was expecting!! No endless white beaches with palm trees and beachside cafes!!! The main beach at Lincoln city is D Beach which is where the D river flows into the sea from Devils Lake. It is a really short beach, with a very icy, very rough Pacific ocean crashing on the shore with a sidewind pumping along the beach!! Perhaps it will be different in the summer??? 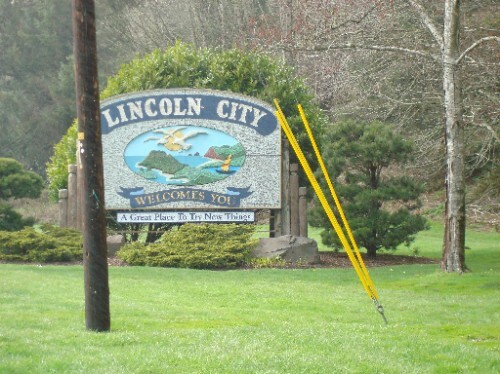 Lincoln City was incorporated in 1965 from 5 different towns ~ Oceanlake, Delake, Taft, cutler City and Nelscott. Highway 101 passes along this stretched out city with a long MAIN street with shops, restuarants, cafes, motels, hotels, art galleries, book stores etc. Lincoln city has favourable winds for kite flying which invite competetors to their annual summer kite flying festival held at the D River beach. Another annual spetalce is the Finders Keepers Glass Float festival where glass floats are placed on the beach for anyone to find and keep. In days gone by, visitors searching Oregon's beaches often found treasures from the east: blown glass floats, in intriguing shades of green and blue. Used by Japanese fishing crews to float their nets, these spheres were as small as two inches (5 cm) or as large as two feet (.6 m). They were hoarded, polished and adored, the ultimate find for a dedicated beachcomber. We drove around Devils Lake which is a little similar to the canals of St Francis Bay, SA. Beautiful houses on the water with panoramic viewing decks!!! We stopped in at the Chinook winds Casino Resort but left the gambling for Las Vegas!! From there we headed south on Highway 101 for a treasure of delights enroute thanks to Mac & Barb!! On the way Mac pointed out the splashes of yellow looking flowers along the roadside. These flowers are known as Skunk Cabbage ~ they grow in wet marshy patches, look a little like Airum lillies but smell like Skunks!!!!! LOL!! Just before the Siletz River we stopped in at the Jennifer Sears Glass Art Studio where we witnessed a glass-blowing demonstration of the glass floats www.oregoncoast.org/foundry . We continued south towards Depoe Bay, population 1100. Depoe Bay claims to have the world's smallest navigable harbour. I sure wouldn't want to navigate through that harbour wall on a rough day!!! In Summer about 60 gray whales reside off the Oregon coast with the best viewing off Depoe Bay ~ we didn't see any whale activity on our great trek!!! We continued south to the spectacular Yaquina Bay Bridge where we crossed into Newport. "A vacation hotspot since 1856"!!! Great restuarants, seaside resorts and hotels ~ we met up with Mac's cousin & her husband for lunch at a great seafood spot overlooking the crashing waves of the Pacific ocean on the rocks below ~ Tidal Raves!! We continued south through the numerous towns of alsea Bay Bridge at Waldport, Tillicum Beach, Yachats - population 635!!! How some of these towns survive when their only industry is tourism is truely a mystery to me!!! We made it all the way down to florence, where Mac's cousin lives, and stopped in at her house for a quick visit. You have to experience dinner at Mo's in Lincoln city to confirm you have been there, so on our last night, we went to Mo's for dinner!!! Quite an experience, with great food and great views of the ocean!!! The next day we ventured north on the Oregon Coast!! Our first port of call was Tillamook cheese factory!!! We watched a very interesting production line where they cut massive blocks of cheese into managable store size blocks, they passed through the line and covered in plastic wrap, vacuum packed, weighed and labelled!!! We then got to samble a few cheeses, then queued for their world famous Tillamook ice-cream!!! Yumm!!! Further north on Highway 101 we came to Cape Kiwanda where we stopped for a photo at the massive haystack volcanic rock out in the ocean!!! That night we stayed at the Shilo Inn at Warrenton, where there was a jacuzzi & swimming pool, so I had a jacuzzi in the evening, watched a movie and went to bed!! !